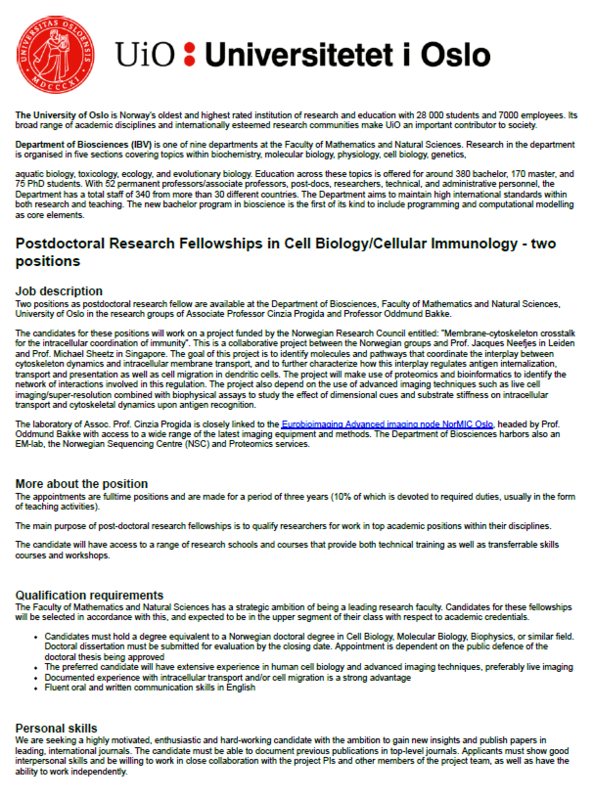 Two positions as postdoctoral research fellow are available at the Department of Biosciences, Faculty of Mathematics and Natural Sciences, University of Oslo in the research groups of Associate Professor Cinzia Progida and Professor Oddmund Bakke. imaging/super-resolution combined with biophysical assays to study the effect of dimensional cues and substrate stiffness on intracellular transport and cytoskeletal dynamics upon antigen recognition. The laboratory of Assoc. Prof. Cinzia Progida is closely linked to the Eurobioimaging Advanced imaging node NorMIC Oslo, headed by Prof. Oddmund Bakke with access to a wide range of the latest imaging equipment and methods. The Department of Biosciences harbors also an EM-lab, the Norwegian Sequencing Centre (NSC) and Proteomics services.